Jordan Sanders (Regina Hall) has a traumatic experience as a young child that alters her for life. She becomes guarded in all her relationships and is self-centred to the extreme as an adult. She becomes very successful and very isolated and is a complete nightmare to everyone around her. Through the spell of a budding magician that she insults, Jordan wakes up as her thirteen year-old self. It’s at this moment that the film should switch into comedy mode, but it just doesn’t happen. 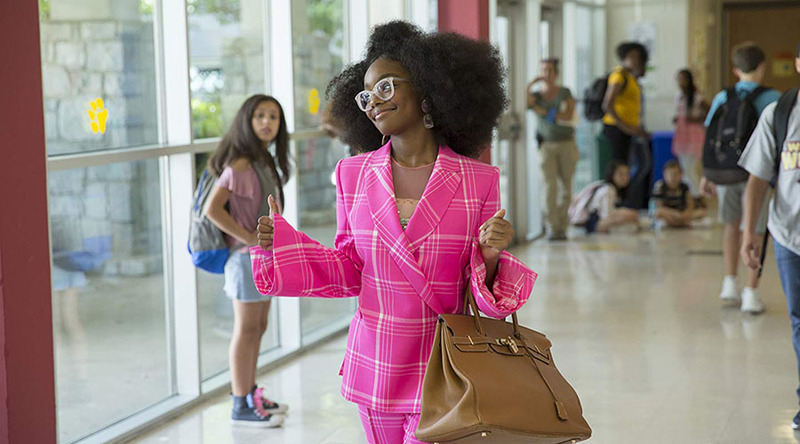 The child actor who plays the adolescent Jordan, a young teenager named Marsai Martin is actually quite good. She is just hampered by a script that goes nowhere. Regina Hall, who was very funny in Girls Trip doesn’t have enough screen time to weave much of her magic. Her take on being a terrible titan of business in the first act is fun to watch but the reformed version in the last act is not. Issa Rae (Orange Is The New Black) also fails to overcome the script struggle. When you tackle a story with such familiarity, you really need to elevate the components and have the wordsmiths outdo themselves. Unfortunately Little comes up short in this task.